It wasn’t so long ago that stamp catalogues contained a handful of grainy, black and white images to help identify an issue. The new GJ Argentina Catalogue shows just how far things have come. Profusely illustrated in full colour on heavyweight, glossy paper, this A4 format catalogue brings the stamps to life and conveys a level of detail that hugely assists in identification. 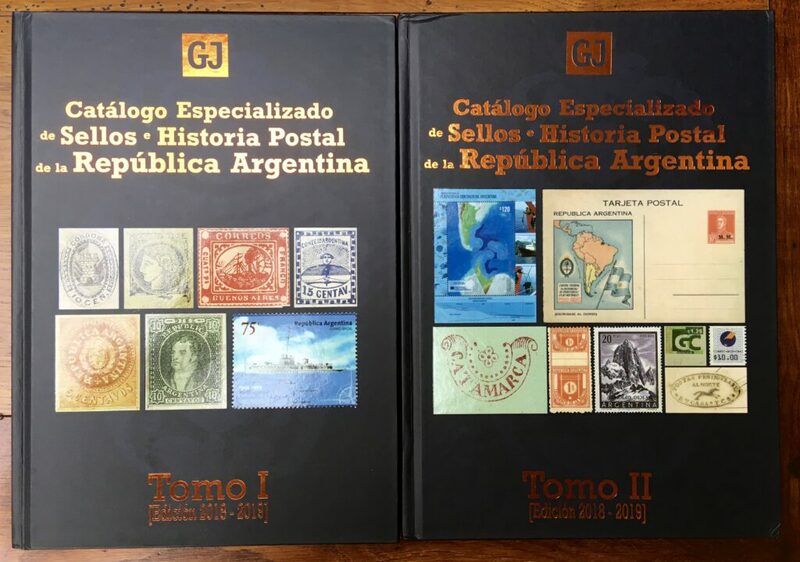 The GJ Catalogue (or, to give it its full name, the GJ Catálogo Especializado de Sellos e Historia Postal de la República Argentina 2018-2019) is edited by the Argentinean dealers Guillermo Jalil and José Göttig. It is a two-volume work. Volume 1 covers the early regional issues of Corrientes, Buenos Aires and Cordoba, followed by Confederation and then Republic issues through until 1999. The second volume picks up in 2000, carrying right through until October 2018. The remaining two thirds of Volume 2 cover the Officials, Government Departmental overprints, Telegraphs and the further reaches of the back of the book. Finally, we get a thorough review of postal stationery, a section on pre-philately and stagecoach mail. Where it excels over previous works however, is in the depth of detail and inclusion of images of the varieties. The authors have gone to great lengths to accommodate a huge number of varieties that become so much easier to recognise when illustrated. The quality of the printing also allows for excellent reproduction of the images, such that shades and colour varieties become far more apparent. The authors have sensibly adopted pricing in US dollars. The Argentinean peso plunged to a historic low against the dollar in 2018 and the comparative stability of the dollar should make life simpler for both dealer and collector. 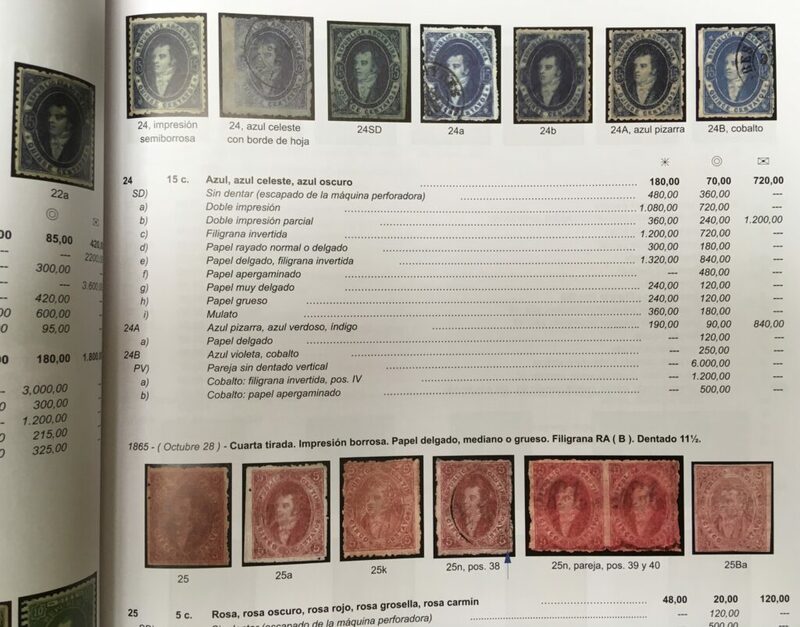 It’s difficult to take issue with what should be an essential purchase for any existing or future collector of Argentina who aspires to go beyond the mainstream catalogues. 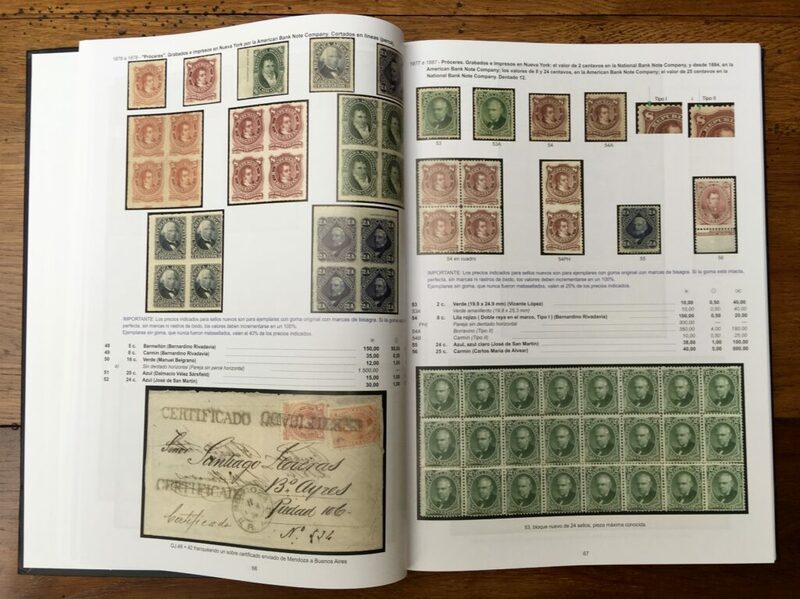 Proof and colour trial listings would be very useful but as this is essentially a catalogue of issued stamps it is probably beyond scope. An excellent addition to any philatelists book shelf and highly recommended. It is nice to see a country stamp catalogue arise locally. For a country’s stamps to gain in value there must be a vibrant local market. This seems a good building block to get there.